The article that we’re reprinting below underlines the plight of many of the nation’s poorest residents who live in communities so small that they fall beneath the regulatory radar of agencies who set and monitor water quality standards for larger communities. This sad situation is particularly true in farming communities where decades of overuse of pesticides and fertilizers have now contaminated local wells and surface waters without provisions for cleanup. SEVILLE, Calif. – Like most children, the students at Stone Corral Elementary School here rejoice when the bell rings for recess and delight in christening a classroom pet. Students at Stone Corral Elementary in Seville, Calif. 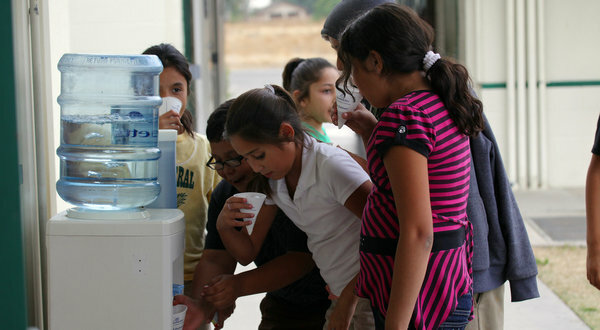 The school budgets $100 to $500 a month for bottled water. Local water has been polluted by years of unregulated agriculture. It is a life teeming with worry: about children accidentally sipping contaminated water while cooling off with a garden hose, about not having enough clean water for an elderly parent’s medications, about finding a rock while cleaning the feeding tube of a severely disabled daughter, as Lorie Nieto did. She vowed never to use tap water again. Chris Kemper, the school’s principal, budgets $100 to $500 a month for bottled water. He recalled his astonishment, upon his arrival four years ago, at encountering the “ghost” drinking fountains, shut off to protect students from “weird foggyish water,” as one sixth grader, Jacob Cabrera, put it. Mr. Kemper said he associated such conditions with third world countries. “I always picture it as a laptop a month for the school,” he said of the added cost of water. Here in Tulare County, one of the country’s leading dairy producers, where animal waste lagoons penetrate the air and soil, most residents rely on groundwater as the source for drinking water. A study by the University of California, Davis, this year estimated that 254,000 people in the Tulare Basin and Salinas Valley, prime agricultural regions with about 2.6 million residents, were at risk for nitrate contamination of their drinking water. Nitrates have been linked to thyroid disease and make infants susceptible to “blue baby syndrome,” a potentially fatal condition that interferes with the blood’s capacity to carry oxygen. Communities like Seville, where corroded piping runs through a murky irrigation ditch and into a solitary well, are particularly vulnerable to nitrate contamination, lacking financial resources for backup systems. Fertilizer and other chemicals applied to cropland decades ago will continue to affect groundwater for years, according to the Davis study. Situated off the state’s psychic map, lacking political clout and even mayors, places like Seville and Tooleville to the south have long been excluded from regional land use and investment decisions, said Phoebe S. Seaton, the director of a community initiative for California Rural Legal Assistance. Residents rely on county governments and tiny resident-run public utility districts. The result of this jurisdictional patchwork is a fragmented water delivery system and frequently deteriorating infrastructure. Many such communities started as farm labor camps without infrastructure, said John A. Capitman, a professor at California State University, Fresno, and the executive director of the Central Valley Health Policy Institute. Today, one in five residents in the Central Valley live below the federal poverty line. Many spend up to 10 percent of their income on water. “The laborers and residents of this region have borne a lot of the social costs of food production,” Professor Capitman said. Bertha Diaz, a farmworker and single mother of four in East Orosi, rises at 4 in the morning to pick grapefruit and other crops. Her chief concern, she said, was how she would afford bottled water. She comes home to an additional chore – filling five-gallon jugs at the Watermill Express, a self-serve drinking water station in nearby Orosi with a windmill roof. When she began receiving cautionary notices from the local water district, she formed a neighborhood committee and also joined AGUA, the Spanish-language acronym for the Association of People United for Water, a network of residents working with the nonprofit Community Water Center. Last month, Gov. Jerry Brown signed the Human Right to Water bill, which directs state agencies to make clean water a financing priority. In the past, communities like Seville trying to make improvements got caught in a noose of bureaucratic technicalities that resulted in years of delays. The answer is sometimes a twisted tale: In Lanare, in Fresno County, the local community services district received $1.3 million in federal money to construct a treatment plant for arsenic-tainted water. But when the system began operating, the cost of water skyrocketed – a result of lowball estimates by construction engineers, as well as the siphoning of treated water to nearby farms. “Before, it was dirty water,” said Isabel Solorio, a part-time housecleaner. “But at least it wasn’t expensive dirty water.” The plant now sits unused. The state is allocating $4 million for interim solutions like filters under sinks that can remove arsenic and nitrates. Even temporary solutions cannot come quickly enough for residents like Eunice Martinez, 47, who lives in Tooleville, where water has been contaminated with arsenic and bacteria. Mobile homes rented by farmworkers sit temptingly near the Friant-Kern Canal, a 152-mile aqueduct that supplies water for one million acres of farmland.